The Nitro is one of the most versatile rifle cases available. This case uses our docking system that allows you, the user, to dock our ammo pouch accessories, as well as the Prairie range bag to the face of the case. 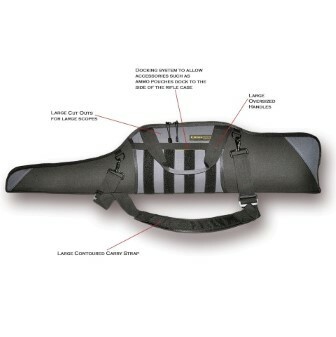 This will allow you to carry to the range, a rifle, pistol, and all the ammo (or extra gear) needed. The Nitro accommodates a large scope or a scope with tall mounts. Constructed out of ballistic weight fabric combined with a fully padded interior, this is considered a semi-rigid case. The Shadow MP - Semi-Automatic Pistol Holster Compact 3"-3.5"
The Vapor - Semi-Automatic Pistol Holster Pocket 1.5"-2"